Bolstered by the increasing rate of change in many markets, organizations are seeking ways to get to market faster, deliver greater value to customers, and better manage costs. 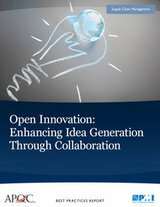 Open innovation, with an emphasis on collaborating externally and internally, can help organizations achieve those goals. Click here to read a brief overview of this report.